Creating a Will or a Trust is a smart and meaningful way to protect your estate for your family. But, did you know that you can also make a significant impact at Habitat for Humanity by adding just a few simple words to these documents? Just a few sentences in your Will or Trust are all that is needed. 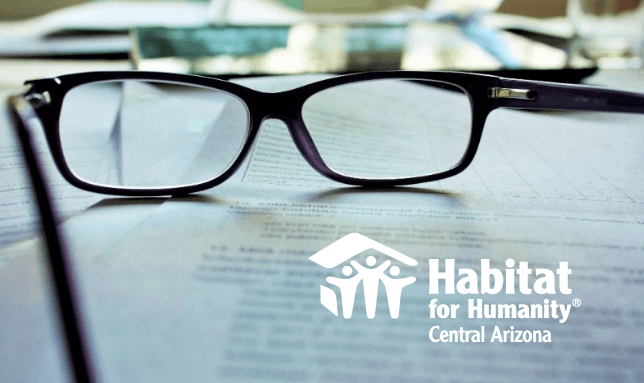 “I, [name], of [city, state, ZIP], give, devise and bequeath to Habitat for Humanity Central Arizona [written amount or percentage of the estate or description of property] for its unrestricted use and purpose.” Then Sign and date it with a witness. * Flexibility – Since you are not actually making a gift until after your lifetime, you can change your mind at any time. * Versatility − You can structure it to leave a specific item or amount of money, make the gift contingent on certain events, or leave a percentage of your estate to us. * Tax relief − If your estate is subject to estate tax, your gift is entitled to an estate tax charitable deduction for the gift’s full value. When planning a future gift, it’s sometimes difficult to determine what size donation will make sense. Emergencies happen, and you need to make sure your family is financially taken care of first. But here’s the best part! It is the most meaningful gift that you can give us and will provide financial support to our mission for generations to come.